Camera company Pisoftech has revealed their new panoramic recorder with 8k resolution and realtime image and video stitching at the Consumer Electronics Show 2018. 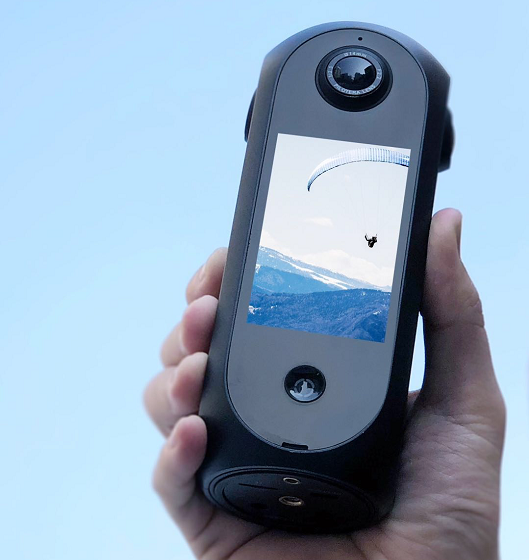 The Shenzhen-based company claims it is the world’s first camera that can capture 360-degrees in VR and provides software-free editing, with all stitching done on the device through a 4G connection. It will feature a variety of shooting modes and will allow users to capture at 8k and 4k with their chosen setting of 30, 50 or 100 frames per second. The device, titled Pilot Era, was unveiled at the Camera section of the CES in Las Vegas on Tuesday. Its panoramic algorithm will allow for images and video to be stitched within device itself, without the need to connect to a computer hub for specialised software editing. The camera will go on sale from April 2018 and will be available on Amazon for an estimated price of $3,000 (around €2,500). Other features of the camera include support for Facebook and YouTube 4k live streaming and connectivity with the smartphone app, which will be used to control the camera via touchscreen or remote. The device will come with multi lens and will have support for four preview modes: fisheye, VR, little planet and equirectangular. Pisoftech specialises in panoramic cameras, using artificial intelligence and image-based algorithms to achieve enhanced stitching solutions. Prepared and edited by Arthur Velker. To follow on Twitter, click here.